Som pak gat ສົ້ມຜັກກາດ (or simply som pak for short) is enjoyed with sticky rice. They're pickled vegetables and a wonderful accompaniment to any Lao meal. At the food markets you'll often find vendors selling them in big bowls pictured above and also placed into ready to purchase plastic bags as pictured below. Like a lot of fermented pickled foods, it's incredibly easy to make at home. Fermented foods are great for your digestion. 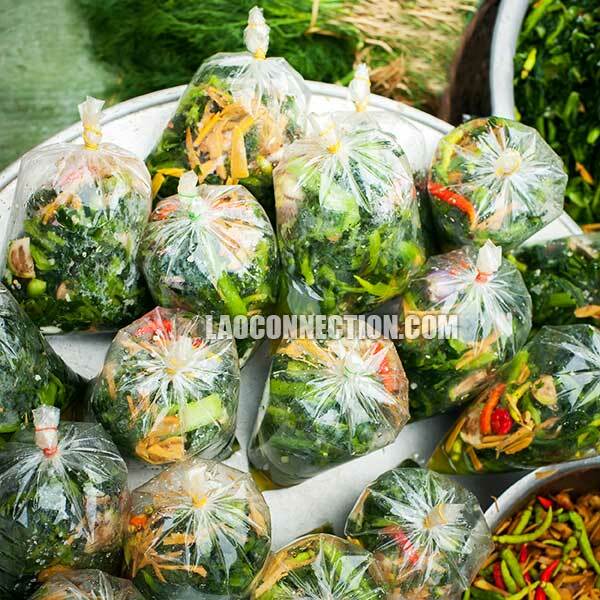 However, in Laos, the vegetables are not left to pickle for an extended period of time like weeks or months. Rather, once it's made it's often consumed within a day or two. The ingredients are simple. 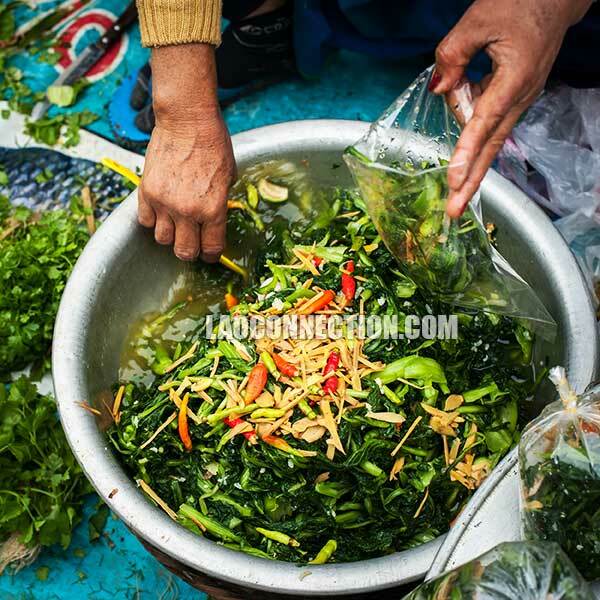 They include sticky rice (previously cooked and soaked in water), mustard greens, salt and water. That's it. You bring it all together by using your hand to stir and press down on the greens. You'll want to do this for a good 5-10 minutes. Wear something to protect your hand from the salt and to help keep things sanitary. Then set aside for a day or two and it'll be ready to enjoy. Of course, if you want to make it unique and adjust the flavours, this is certainly doable. But it's typically done after the pickling process is complete. Here are some suggestions to make it a bit more original and tasty. Place the pickled veg into a small mixing bowl. Sprinkle a bit of sugar to counter the sharpness of the salt and tang. Add a bit of thinly sliced ginger to give a punch of freshness. And for a bit of hot spiciness, you can chop a small red chili pepper into it. You can also try adding a bit of minced garlic or a finely chopped shallot. Give everything a nice stir and taste. Make adjustments as per your personal preference. Explore your own variations - som pak need not be boring. Enjoy!